There’s really no need to mess with Mamma Mia! The jukebox musical, when it is allowed to breathe and just play itself out, is magical when left to its own comic and quirky devices. 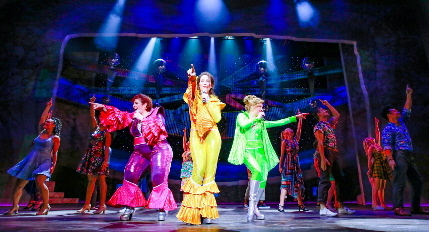 Mark Martino, directing and choreographing for The Maltz Jupiter Theater may have had the same idea, seeing that this production keeps all the jukebox musical’s guilty pleasures intact, and instead focusing the energy into mining the gold in what’s already inherent in the ABBA-inspired tuner. This Mamma Mia gets its mojo from a strong, consistent cast to carry out the sitcom-esque plot that is held together as if by taffy – twenty 1970s radio hits that are ingrained in pop culture. The show was quite a conversation piece when it arrived on London’s West End on April 6, 1999. It wasn’t a compilation of pop songs, or a tribute show to ABBA, but created a story that had nothing at all to do with the Swedish group. Their catchy tunes just somehow fit into a storyline – not exactly, mind you, and that’s part of the charm. And, here’s where the story begins: 21-year-old Sophie (Becca Andrews, fresh off Slow Burn’s Legally Blonde), who grew up on a Greek island where her single mother, Donna (Mary Mossberg) owns a taverna, is about to marry Sky (Eric Schell). But before she does, she’d like to know who her father is. After finding mom’s diary dated 1979 about her summer of love in Greece, she tracks down the three guys mentioned within: Sam (Jim Ballard), Harry (Peter Simon Hilton), and Bill (Christopher Carl) and invites them to her wedding. Her mother’s two best friends are already en route to attend the nuptials. Tanya (Elise Kinnon) and Rosie (Margot Moreland) were part of a rock trio called Donna and the Dynamos back then. The musical, with a book by Catherine Johnson, and music and lyrics from Benny Andersson and Bjorn Ulvaeus of ABBA (the pair were also co-composers on the Broadway show Chess), played on Broadway for almost 15 years after it opened in 2001. Its appeal grew in 2008, with the film release starring Meryl Streep and Amanda Seyfried, and with the sequel released ten years later in July 2018 with singer Cher added to the cast as Donna’s mother. Many in the Maltz audience at intermission could be heard saying, “I saw the movies, but have never seen the live show.” Lucky for those folks, this staging of Mamma Mia! is as good as any touring production, not only because of the confident cast, but because of the devotion to the show’s theatrical roots, not its movie offshoots. But this show never gives a hint that any movie was made, let alone that the legendary Streep put her own stamp on the character of Donna. Mossberg, who played Donna on a national tour, and then recently in July 2018 regionally at North Carolina’s Flat Rock Playhouse, gives the mother-of-the-bride-to-be a relatability, and puts an original spin on the characterization. There’s not a shred of Streep in it. She turns many an ABBA pop tune into a musical moment, but her “Winner Takes It All” had the audience cheering, and deservedly so. Andrew’s Sophie is perfectly wide-eyed and winsome, and, as the character must play off of everyone in the show consistently, she develops along with each of them. The three “Dads” each get their time to build, too, and the actors bring us along for their ride. Ballard, a familiar face in South Florida theater, as Donna’s real long-lost love is all heart and soul as Sam the architect, plus he’s one of the best local musical theater singers, thank goodness (does anyone recall Pierce Brosnan in the film version as Sam and his cringeworthy version of “S.O.S.”?). Ballard and Mossberg’s S.O.S. is a highlight. Carl, who has played all three Dads in the Broadway production, is a perfectly cast here as the Aussie traveler, Bill. And, Hilton steals every comic moment as Englishman Harry, buttoned up, but then letting loose as a.k.a. Headbanger Harry. A strong supporting cast and ensemble have plenty of charisma. A special nod to standout Marcus Shane as Pepper, the cabana boy with the hots for older women. Sophie’s girlfriends are played by Emily Kelly as Ali and Taylor Broadard as Lisa, and Alex Jorth is the second cabana boy Alexandrios. The rest of the hardworking, dance and song talented ensemble include Brittany Conigatti, Zach Gamet, Whitney Grace, Jawan Hayes, Taylor Jackson, Kyle Laing, Emily E. Tarallo, Conor Walton, and Kyle White. Eric Alsford’s musical direction was especially strong in the pit, where the instrumentation of ABBA’s songs came through loud and clear, but never overpowering. Pit singers Allegra Miles and David Williams provided the chorus support. Marino’s choreography, at times, took an obvious influence from traditional Greek folk dance, an inventive highlight. The rest of his choreography was perfectly crafted. Having just seen Paul Tate dePoo III’s amazing stage work and video mapping for South Florida Symphony’s Porgy and Bess, what a delight to take in his Mediterranean scenic design and backdrops that literally came to life. Kevan Loney’s projection design rendered such realistic ocean waves, you could almost smell the Aegean Sea air. The cool lighting design by Zach Blaine was perfectly suited to the island setting, along with Marty Mets sound design. Andrea Hood is costume designer along with Gerard Kelly as wig designer. There’s much to love about Maltz’s production of Mamma Mia!, but most especially is its ability to stay true to the stage version, rather than try to please the movieplex crowd. Mamma Mia runs through Feb. 10 at Maltz Jupiter Theatre, located at 1001 E. Indiantown Road, Jupiter. Show times are 7:30 p.m. Tuesday to Friday, 2 p.m. Wednesday, 2 and 8 p.m. Saturday, and 2 p.m. Sunday. Tickets cost $60 and up. Running time is two hours and 22 minutes including intermission. Call (561) 575-2223. This entry was posted in Performances, Reviews and tagged Maltz Jupiter Theatre, Mamma Mia. Bookmark the permalink.